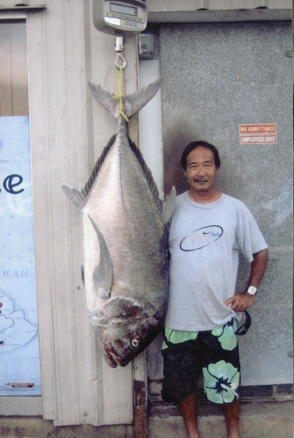 Ronald Nakashima was fishing near Kahuku with Sid Kunimura and Paul Yoshikawa on a full moon night with a brand-new Nitro pole when he hooked his monster ulua. The giant fish tested Ronald's Newell reel and 65-lb test PowerPro but found no weaknesses. In the end, the 104.4-lb giant trevally was beached.